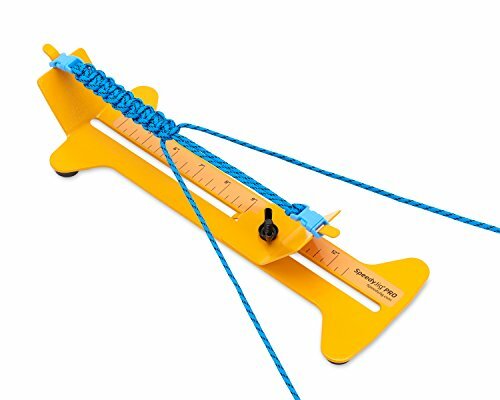 The Fastest and Easiest Way to Make Perfect Paracord Bracelets from 4" to over 12"
Introducing the SpeedyJig PRO paracord bracelet maker. Made from durable steel (not soft wood), the four rubber feet hold the jig steady while you are braiding. Perfect for use on a table top, the bed or even your lap. The wide design will not tip over and the heavy construction will keep it from moving around. Want to use a different style or size buckle? No problem. The unique buckle holding system allows you to easily and quickly slip on just about any buckle size or style without tools. Need to make a longer or shorter paracord bracelet? With the simple design you can quickly adjust the length of the SpeedyJig just using your fingers. No tools needed. And the handy ruler on the top of the SpeedyJig makes finding the right size you need a snap. The SpeedyJig Bracelet Maker Jig and Kit comes complete and includes the SpeedyJig PRO, 3 hanks of paracord, 4 buckles, and full color instructions. The instructions are easy to follow and will have you making perfect paracord bracelets within minutes of opening the package. For ages 8 and up. WARNING: Choking Hazard. Small parts. Not for children under 3 year. Made in USA.